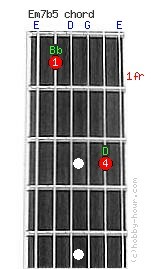 Chord Em7b5 notes: E, Bb, D, G, D and E.
The strings 6(E), 4(D), 3(G) and 1(E) are left open. Em7b5 - E half-diminished minor 7th guitar chord's alternative names: Em7-5, Eø, Em7b5, E-7b5, Emin7-5 and Emin7b5. See also: Edim and Edim7.